Many of the top teams all over Europe have now changed to formations using a back three defense. Antonio Conte won the English Premier League Championship with Chelsea playing a 3-4-3 and claimed it was the most flexible formation that allowed him to change to the 4-3-3, 4-2-4 and 4-2-3-1 if the game dictated it. Conte was asked how he had come to change to the 3-4-3 formation and he answered: "In my mind I planned a 4-2-4, then we changed to 4-3-3 and we also used the 4-2-3-1. What I did notice in some situations was that we did not have the right balance, because we conceded too many goals. For this reason we changed to a 3-4-3 which I think is a good system for our team, partly because we have strikers suitable for this module." The bottom line is, playing with a back three will give you more flexibility to make tactical changes during the game and give you more and better attacking options. 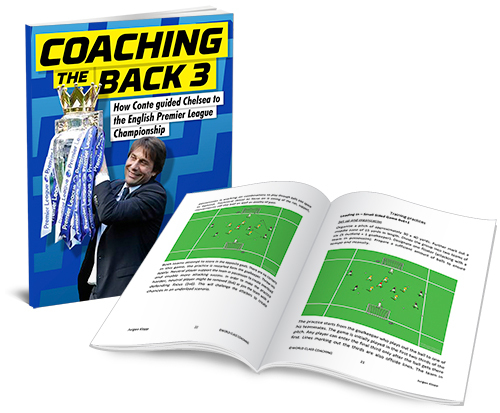 This book will break down all the tactics and give you sessions you can conduct with your own team so they are comfortable with a back three and understand their roles.